Graphics students at The Sixth Form College, Solihull have been commissioned to design a poster for the College’s Summer Art Show. This live brief has been given to first year A level Graphics students and they have four weeks to complete the project. The Summer Art Show takes place on 19 – 22 June, when artwork from A level Fine Art, Graphics and Photography students, as well as that of BTEC Art & Design students, will be exhibited. 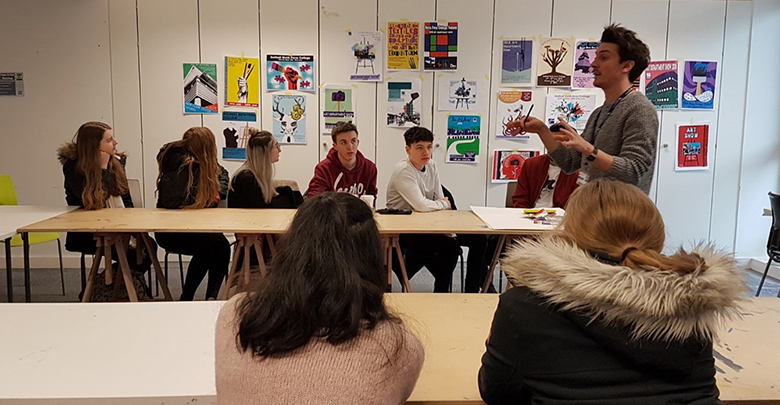 The Graphics students need to come up with a poster design that reflects the diversity of art specialisms and the diversity of the students whose work is on display. Students exhibit a rich range of work covering all disciplines including fine art, sculpture, illustration, photography and Textiles to name a few. The winning design will be printed using screen printing, so as part of the project, students are being asked to research the process of screen printing and its possible uses, with particular focus on commercial applications. To this end, students visited Birmingham City University to help them with this project. They enjoyed a workshop and a talk from a practising illustrator. As well as Graphics, the College offers A levels in Fine Art and Photography and a BTEC Extended Diploma in Art & Design.